I come from a long line of family historians, and we are always brainstorming ideas to get other family members interested in our ancestors. My mission this year was to spark an interest in my four-year-old cousin (soon to be five, as she will tell me). She may be too young to understand charts or many of the details of our history, but I wanted to find a way to give her an idea of who we are – and where we came from – in a way that was exciting and approachable. I decided that we would give her a tour around the world of all the places her ancestors came from without ever having to leave her living room. Her gift is one that can be easily changed to fit your unique family background, an easy and fun way to get kids interested in their family roots by introducing them to cultural elements from the places of their ancestry. Instead of the usual toy for Christmas this year, my cousin will receive a laminated map of the world (so she can write on it with a dry erase marker) and a small suitcase that once belonged to our grandmother. 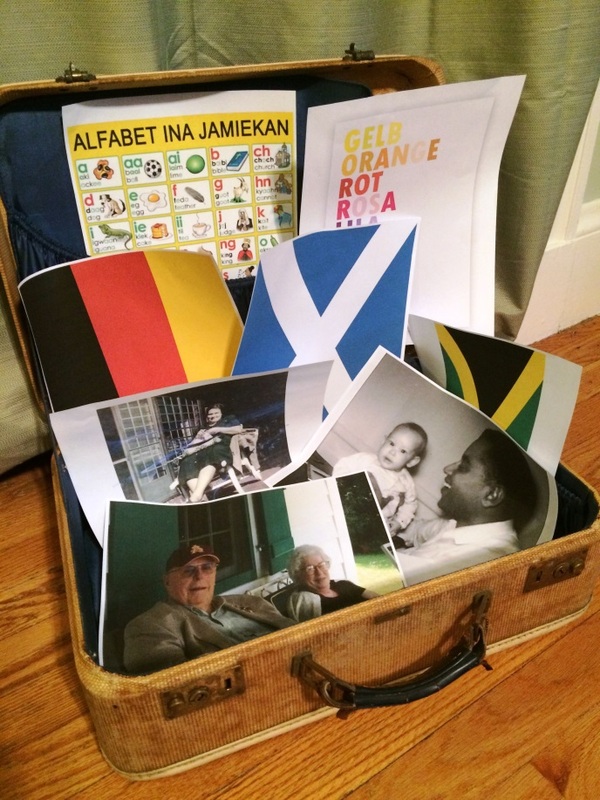 Inside the suitcase will be activities, recipes, flags, and pictures of the three places that make up the majority of her ancestry: Germany, Scotland, and Jamaica. She will also get a homemade passport and stickers so she can mark the locations she has “been” on her journey into her own history. The plan is to continue the gift all year long by sending her packages of materials from different countries in the mail. What kid does not like getting presents at any time of year? Each time she gets a new package, she will be able to find the location on the map, try a new recipe from that part of the world, and get a small cultural craft or activity from the country in question. When possible, I will also be including pictures or stories of family members from the country so that she can learn about a family member and have a personal connection to what she is learning. I hope that she will gain a better understanding of the world and her people to encourage a sense of pride in her heritage. Since my cousin and I are true products of the America melting pot, I hope she will also learn how small the world really is and that she is connected to many places and peoples. By having the package from each country include a recipe, it gives kids the opportunity to taste the food of their people; it is also a nice way to also introduce them to some family recipes! To start her world adventure, my cousin will get a family shortbread recipe from Scotland, a pretzel recipe from Germany, and a banana fritter recipe from Jamaica. The recipes are relatively simple and are things she could easily help her mother make. We wanted to be sure that the recipes represented a country, but were also things that were not too complicated for her to help make. My cousin also really enjoys crafts and hands-on activities. On Christmas, I’ll be showing her how to tie a Celtic knot in the shape of a heart, and we will make black, green, and gold bracelets for the Jamaican flag. Since Christmas is filled with so many German traditions, I plan on using the opportunity to explain how many of the things we already do to celebrate the holiday are a part of her German heritage. She will also get a stack of coloring pages for each county, which can be easily found and downloaded on the internet. There are many activity pages for kids of various ages, such as word searches and connect-the-dots with themes from different countries. I also found some German language pages that include the alphabet and colors, so that she can learn some of the language as well. By continuing to send my cousin packages from different countries of her ancestry throughout the course of the year, I hope to maintain her interest in learning about her roots. By creating a strong pride in her heritage at an early age, I hope it will lead to a life-long love of family history. What a wonderful idea! I’m keeping this post for next year. I’m about to start writing a book titled “From the Mayflower to Me,” putting my grandsons’ Mayflower lineage in story form. Once I complete the text, I’ll hire an illustrator. I’m hoping to have this ready by the time my older grandson is 7. In the meantime, I’ll be compiling things for your map-and-suitcase idea. Thanks! Fran, Happy New year! As a fellow Mayflower descendent (Bradford, Alden, Mullins), I like your book title. Since I am writing solely for my descendants benefit, you have given me the idea to call my work “From the Mayflower to You” Thanks. How much love you must have for this young cousin, to invest the effort it will take in the coming year to provide all the crafts, maps, recipes, letters, etc. for her! And I’m sure you will get her hooked. At the beginning it may only be on her relationship with you, but after all, that is where family history and genealogy start–with the family stories. I clearly remember my Scots-Irish great grandfather, who my parents made sure we visited annually. He died when I was eight and he was ninety-two, but I have some wonderful memories of him. Between our visits to him, he sent my siblings and me typed letters and postcards telling about what he was doing and who his visitors were. My father, his grandson, saved those letters. What a treasure! What a brilliant imaginative enterprise! You’re setting your cousin on a course that will take her on a journey through history, geography, and culture throughout the rest of her life, not to mention specific family connections. Over the last twenty years, I have worked to connect my children genealogically.to all sorts of well-known historical characters. As a retired social science professor, I want them to know as much as possible about history, and this is one way to personalize it. This is a great way to help children relate to their history because it reaches them at their knowledge level and helps them learn more. I will be starting this with my five-year-old great grandson and telling others about your idea. Thank you so much for sharing it with others. I just started a Facebook group for my paternal side of the family and I will be linking your article to it. While, I do not have children I have cousins who have young children and I want them to enjoy learning about their history as much as I did as a child. I am grateful to my parents for teaching me about who I am and where I came from. Thank you for the great idea. My granddaughter is now almost 10 and I have worked to see that she understands where she comes from, but it seems to have fallen on deaf ears. We did do some of my recipes together, but at the moment she seems much more interested in sports. This is harder than it should be.